By unanimous consent, the House of Representatives has passed S. 3624, the Military Commercial Driver’s License Act of 2012, which gives active duty military personnel, military reserves, members of the National Guard, active duty United States Coast Guard, and Coast Guard Auxiliary members more flexibility in obtaining a Commercial Driver’s License, allowing them to pursue job opportunities immediately after leaving the service. U.S. Senators Patty Murray (D-WA) and Olympia Snowe (R-ME) introduced the companion legislation (S. 3624) in the Senate last week where it also passed unanimously. The legislation is expected to be signed into law. According to the Truckload Carriers Association, approximately 200,000 long haul trucking jobs are currently open nationwide. As the economy improves, the demand for commercial drivers to transport manufactured goods is expected to rise. The Bureau of Labor Statistics estimates that the trucking industry will expand by more than 300,000 jobs between 2010-2020. According to the American Transportation Research Institute, the trucking industry in Indiana provided 179,290 jobs, or one out of 13 in the state in 2011. Total trucking industry wages paid exceeded $7.7 billion, with an average annual trucking industry salary of $42,784. In 2012, there were over 13,700 trucking companies located in Indiana, most of them small, locally owned businesses. These companies are served by a wide range of supporting businesses both large and small. 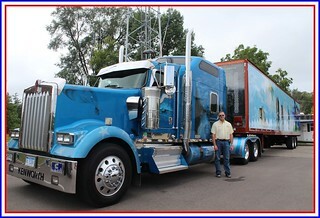 Additionally, trucks transported 80 percent of total manufactured tonnage in the state in 2010 or 690,058 tons per day. Over 80 percent of Indiana communities depend exclusively on trucks to move their goods. Under current federal law, states are only permitted to issue CDLs to those who are legal residents of that state. Since military personnel often receive their vehicle training in locations other than their home states, such as their duty stations, the law makes it difficult for members of the armed forces to obtain a CDL before leaving military service. Both the Department of Transportation and the Department of Defense have identified this law as a barrier to employment for veterans.